The Application Help DocumentationCoach/Professional Help Documentation Yearly Plans: Periodisation and PlanningYearly Plan "Start Day"
Previously, the system showed weekly breakdowns from Sunday to a Monday and any calculations of load or average would be based off the Sunday to Monday period. Now you select the Start Date and also the Start Day that you want the weeks in the yearly plan to run from. This allows you get workload, daily monitoring or other calculations running for specific day-day ranges, e.g. you may run the week from Monday to Sunday, or Friday to Thursday. The Start Day gives you flexibility to start your week when you need it. The image in the example here shows the calculations for data calculating from Wednesday (it used to only calculate from Sunday). All of the data in the yearly plan is now grouped by Wednesday to Tuesday period. You can see that the sum at the bottom of the plan shows 1, 35 and 69 for the weekly totals. If we were to change the start date, these will calculate different date periods, as shown in the images below. 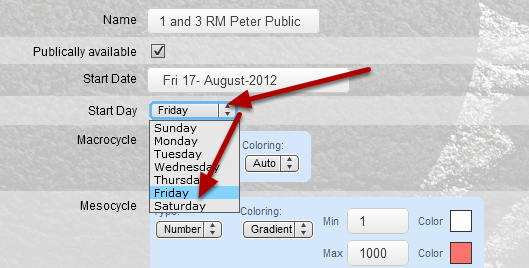 If the Start Day is changed the week will start from the new day that is selected, e.g. a Friday, and the data will be calculated from Friday to Thursday. The image in the example here shows the calculations for data calculating from Friday to Thursday. All of the data in the yearly plan is now grouped by a Friday to Thursday period. You can see that the sum at the bottom of the plan is different to the Wednesday start date (1, 35 and 69) and it is now 6, 49 and 50. Consider what Start Day you need to represent your data accurately based on how users record and report your data.